USB Disk Security will keep your computer safe from viruses; spyware and Trojan attacks especially coming from flash drives in addition of locking flash data. A simple, smart, light and professional antivirus software that will defend any computer against anytype of threats or viruses. External media such as external hard drives, USB flash drives, memory cards and mobile phones are very popular threat transferring devices nowadays. Especially hackers using these techniques for those computer that are not connected with internet or network. They will survive in infecting user computer easily. 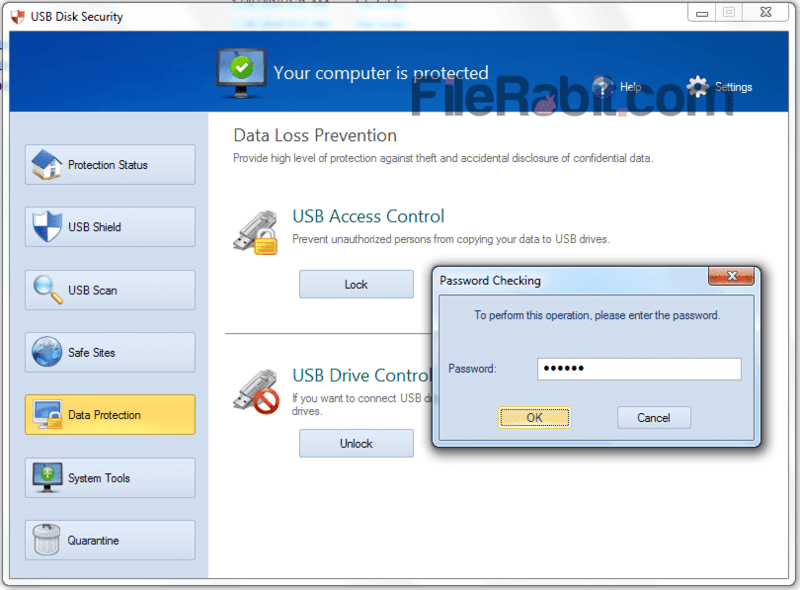 However, most of security and privacy protection software will hang system during normal usage, but USB Disk Security is one of light weight and less resource taking application in this category. The developer is offering device locking and password protection feature. It has intelligent virus detection engine that works in system background and keep searching for malicious or suspicious attacks. It will lock all of data existing in external devices especially USB flash drives so no one can delete, copy or format these devices without password. Offline computers are mostly safe from attackers but they will hit those computers or networks with autorun.inf file support. This file includes command or exe file that will start running, copying and damaging important files. Furthermore, new folder.exe is big example of threat that surely hurts millions of offline computers rapidly. It support all external devices such as mobile internal storage, memory cards, SD cards, flash disk, MP3 players, pen drives, USB drives, HDD drives, thumb drives, USB and other removable devices as well. The database is up to date and has filled with known and unknown threats. It has compatibility with all antivirus applications so it will never interrupt any 3rd party software while running in background. ZbShareware USB Flash Security will never let any unknown person to steal your personal information without authorization. Moreover, the powerful scanning system will automatically scan and detect anytype of threats, worms, Trojans and viruses. At the end, best security and virus defending software for Pentium III or similar computers.